Fissidens grandifrons var. Planiccaulis it is still one of the most magnificent Fissidens found in aquarium. Its unique design create dark-green branches and oblique stacked leaves. Its slow growth makes it very desirable moss. Could not be confused with any other Fissidens. 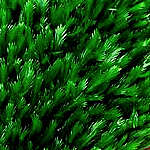 This moss does not require strong light and CO2 injection to grow well, so it is a great addition for a shrimp aquarium. Each portion is 5x5 cm on stainless steel wire mesh (safe for aquarium).